Fine Arts photographer Tammy Swarek is based in Arkansas and has photographed homeless animals for UCAPS (Union County Animal Protection Society) in El Dorado, AR for a some years. One day, my designs caught her attention and she inquired of me if I would join the pet adoption awareness campaign 'The Shelter Pets Project' in which they would have dogs that are in shelters and up for adoption as models. Without hesitation, I said 'Yes' and created The Matador collection for the dogs. It's a series of different Matador outfits featuring replicas of what are known as "Suits of Lights". I shipped the collection, including hats to Tammy. Once the photographs were released, the press picked up on the project and all the dogs involved were quickly adopted. The series has been featured in Vanity Flair Italia, The Guardian and Italian Vogue. We have worked together on the project over the last two years with much success raising needed revenue for the shelter. 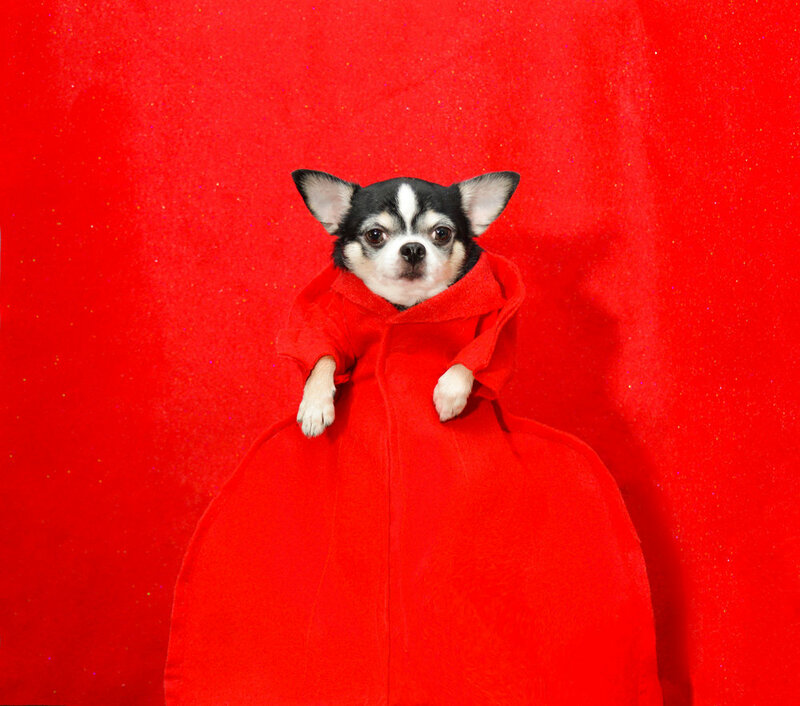 For the Canine Couture book, Tammy will fly to New York City and stay for a limited engagement to photograph the dogs whose owners pledged for her name. I first met Mouhsine about 3 years ago, when he was assigned to cover the behind-the-scenes of one of my runway shows for New York Fashion Week at Gotham Hall. I remember that particular time being very stressful. I had two back to back runway shows at two different locations with 2 sets of models and canine models as well. I must that there were different hair and makeup teams for each show. Mouhsine and I hit it off immediately and have become close friends. We consider ourselves family. Over the last 3 years, he has photographed editorials of my designs and studio shots for my website. For the Canine Couture book, Mouhsine will photograph the dogs that pledged to his name in New York with photo shoots throughout the Summer 2018 by appointment. Robin Hagy is a Conceptual/Fine Arts photographer based in Sacramento, California. She has photographed homeless animals of all sizes from the Front Street Shelter in Sacramento for several years. The photo above and one below are by Robin and of dogs from the shelter wearing my designs in hopes of getting adopted. For the Canine Couture book, Robin will join me in Los Angeles in early August to photograph the dogs that pledged for her name. Robb did not start out with intentions of being a professional photographer. He, in his personal attachment and admiration of my work, found himself photographing my creations for my archives. With time and tips from several photographers,who are friends, Robb decided to take up photography. It was after his photos were praised then featured by the photo editor of one of the most prestigious fashion publications Robb came into his own as one of my favorite photographers. Robb's photographs of my designs have since been featured in Vogue Italia, Harper's Bazaar, People Magazine, New York Times just to name a few. Robb takes all my travel photography including the photos from Greece, Paris, Italy, Spain and any other locations. For the Canine Couture book, For the first time, Rob will photograph other dogs besides my Chihuahuas that pledged for his name. This book project will be the first time we'll be working together, which is why we don't have any pictures by David of my designs to show. As you can see by the photo above and two below, David has a unique eye with vivid colors and I am excited to collaborate with him on this project. David Ayllon is a photographer, graphic designer, and superhero aficionado. Ayllon first discovered his love of larger than life characters during his childhood on Long Island, where he found himself preoccupied with fantastical worlds served up by comic books & professional wrestling. As a queer Latino, Ayllon’s fascination with persona grew from adolescent escapism into a process of examining gender, personal history, and self-expression through his photography & design. By collaborating with noted personalities from the drag community, Ayllon creates dynamic narrative portraits that explore nostalgia and identity through the lens of artifice, urban fantasy, and pop-culture. In 2017, Ayllon designed a range of enamel pins for StrangeWays.com, which are once again available after selling out within their first week of release. His photography has been featured in the Harvey Milk Photo Center, as well as in the pages of such publications as Paper Magazine, Huffington Post, OUT Magazine, Next Magazine (cover), and more. His work honored with such award as the 2017 PDN Faces competition (first place), 2016 Rangefinder Seeing the Light competition, as well as the 2009 IAC award for Best Design Website. A graduate of Seaton Hall University with a B.A. in Graphic Design, Ayllon is currently completing the final year of his MFA from Savannah College of Art & Design. News Flash! I have the distinct honor to announce an addition to our team of photographers whose artistry is being showcased in my couture coffee table book. For years Yoni has photographed me, my work and many of my designs on models both canine and human. We are blessed to have my personal friend Yoni Levy photographing a very special section of our book. This as they say is the cherry on the cake. I will be personally arranging the shoot and picking the models to be featured. More details to come. Yoni’s section will be dedicated to his late son Tal Levy and photographed at Tals Studio in New York.